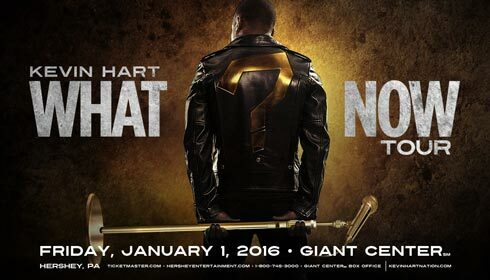 Philadelphia native son, Kevin Darnell Hart, is coming to spend New Year’s Day with us in Hershey! His newest show is titled, What Now? and promises to bring more of the fabulous Mr. Hart than ever before. Playing to packed houses wherever he appears, his 2+ hour show is a combination of storytelling, jokes, inspiration and visuals..enough to keep you glued to your seat! Expect a story about racoons (? ), lots of gold jewelry and some eye popping background scenery. Opening for Kevin will be the Plastic Cup Boyz…featuring Joey Wells, Will Spank Horton and Na’im Lynn. Hart began his career by competing in and winning several amateur comedy competitions in clubs throughout New England. His first real break came in 2000 when Judd Apatow cast him in a recurring role in the television series Undeclared. He has won numerous awards for best actor, outstanding comedy series, entertainer of the year and comedic genius award among many.